Dog in the Snow’s latest single is a more electronic affair than their earlier work, and their best yet in our opinion. The NME have just caught onto the New Union’s new single Now. We first posted about it back in February. IYES ascendancy continues apace with their new single Breathe which ropes in production dues from MNEK. Another Brighton band who’ve roped in a name producer are Phantom Runners, whose new single has the guiding hand of the Fun Lovin Criminals’ Huey Morgan. The original of Fall was a more guitar based post rock affair, but in it’s remixed form is much more blissed out. Over the course of March, A Lily put out an EP of four cover versions called Augury. Their version of Love’s A House is not a Motel is our pick. Eagles for Hands latest soundcloud upload is a collaboration with Sivu, which shows a completely different side to both artists work. The new video from Black Rooster Black Shag is another teaser for the band’s debut album which gets released on 1st May, which we’ll be telling you more about very soon. Hylia is the track with the strongest Eastern flavour from Hypnotized’s new Telesto EP, marrying sitars with rolling beats. Here’s this week’s roundup of the new music that we’ve heard. First up is a new track from Eagles for Hands featuring Sivu. Farewell Appalachia isn’t Eagles for Hands normal fare, being vocal and more more song-like, with his trademark electronica being used to subtle effect. Next is the latest upload from A Lily. We mentioned last week that throughout March they’re putting up a track every week. This week they’ve covered Love’s A House is Not a Motel. Them The Sky put out a remix of their track Fall which featured on last year’s Echolalia EP. London’s Finjin is on remix duties here, chopping up the vocals and underpinning things with lovely burbling electronica. Finally we have a track by Rooster Cole – formerly known as the front man of Black Black Hills, something you’ll spot as soon as the vocals kick in, although The Waiting Place is a bit less rock’n’roll and a bit more dramatic, with few less guitars and a broader palate of strings and piano. We’ve got a bumper New Music post for you today. I went to go and write it mid-week but Soundcloud was down and since then there’s been more tunes to write about. First up is Michael A Grammar whose Random Vision EP is out on January 27th. We’ve previously featured another track on the EP (The Day I Come Alive, back in November), and now another track Suzanna is out there. We featured Japanese Sweets in last week’s gig picks. It’s the new pseudonym of Speak Galactic’s Owen Thomas.Slow Motion Crash / Around You is widescreen prog electronica which makes Speak Galactic almost seem like pop music. Changing tack completely, we’ve got the new folk rock single from Stark. Let’s Fall Down Together is out now and the band are playing at the Prince Albert on 4th March. For this week’s gig picks, we’ve got tie-ins with two different festivals and some local media big hitters putting on gigs, as well as a few other odds and sods. You may have heard that Brighton Digital Festival is on in town at the moment and as part of that Pop Up Brighton return with their Sound Screen event, bringing together local bands with international visual artists. On Thursday night at the Corn Exchange Phoria, Luo and The Hundredth Anniversary play to a backdrop of visual collaborations that the bands and video artists have been working together on for the last six weeks. Meanwhile Time for T headline at the Hope for Brightonsfinest, with Gypsy Switch, Paper Hawk and Prisoners Cinema also playing, and Monsters Build Mean Robots and Spacenoid are on the bill at Brighton Noise / Nice Weather For Airstrike’s Industroika gig at the Prince Albert. On Friday Night Lloyd Williams and Ellie Ford launch their debut release at St Mary’s Church, Black Rooster Black Shag headline the Prince Albert, and Bad for Lazarus play Sticky Mike’s. Saturday night is the third of The Haunt and Juice Brighton’s short run of weekly gigs. This week they have Them The Sky, Garden Heart, and Paper Hawk on the line up. 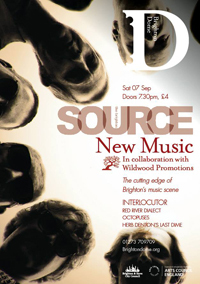 It’s also the first of this month’s two Source New Music Nights (they’re hosting another on 20th as part of Brighton Digital Festival). This one is curated by Wildwood Promotions and is headlined by Alex White’s Interlocutor, with Red River Dialect, Octopuses and Herb Denton’s Last Dime playing too. Finally, it’s the Over The Moon Festival’s pre-party at the Blind Tiger, with a line up that includes Eagles for Hands, Mitch Wade Cole, Platypi, Eone and Murder He Wrote.